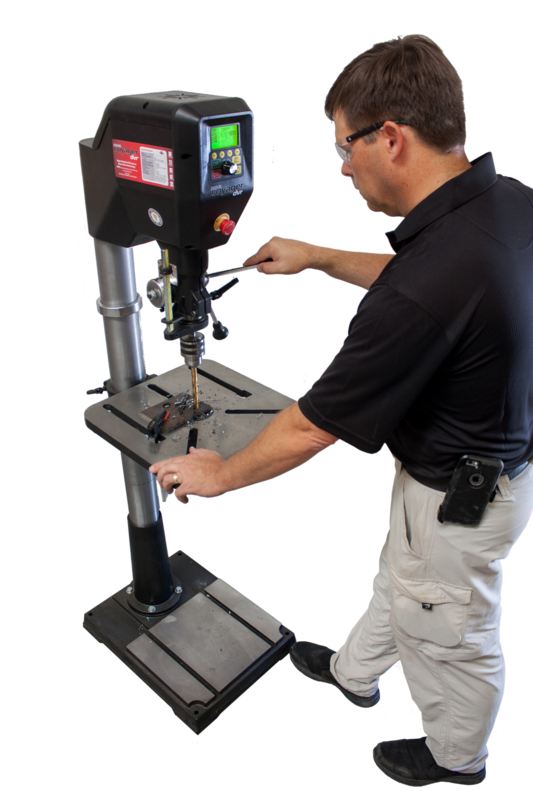 The Nova Voyager DVR is the world’s first intelligent drill press. The drill press is one of those tools that we all take for granted. Its design hasn’t changed in a hundred years: a chuck on a spindle that is spun by a sequence of belts and pulleys. Now a New Zealand company, Teknatool, has thrown that out with the launch of a revolutionary new concept that has implications for machine-tool technology across the board. The Nova Voyager DVR 18-inch pedestal drill press is a complete rethink of the tool that will set the benchmark for the future. At the heart of the Nova Voyager is the Digital Variable Reluctance (DVR) two-horsepower motor developed by Teknatool to power their very popular Nova DVR wood lathes. The DVR motor is a digitally controlled, brushless, direct-drive, infinitely variable-speed motor that electronically monitors power usage and keeps the torque constant despite the load, smoothly driving speeds from 50 to 5500rpm when the knob on the interface is turned. The motor is programmed via an on-board computer with a control knob interface and screen. It can be preset to specific speeds according to what material it is drilling, what drill type is being used, and the size of the hole required. Traditionally bit speed was set with a combination of belts and pulley clusters and was an approximation at best. However, this drill can do more than merely set speeds. It has a built-in menu of 12 different drill-bit types ranging from twist drills to hole saws to fly cutters. The menu allows you to enter the material you are drilling (wood, plastic, or metal), the size of the hole and the depth, and selects an appropriate speed for that application. The computer constantly monitors the power to the motor to ensure that the torque at the drill bit remains constant. It also determines the drill depth, warns you when you are approaching the set depth, and stops automatically at the right depth. You can programme the drill to automatically reverse to clear debris once it reaches its prescribed depth. For repetitive operations the drill can be programmed to start as soon as you pull the quill handle so you can drill a series of precise holes in sequence, such as drilling holes for shelf supports in cabinets or for drawer-slide hardware. 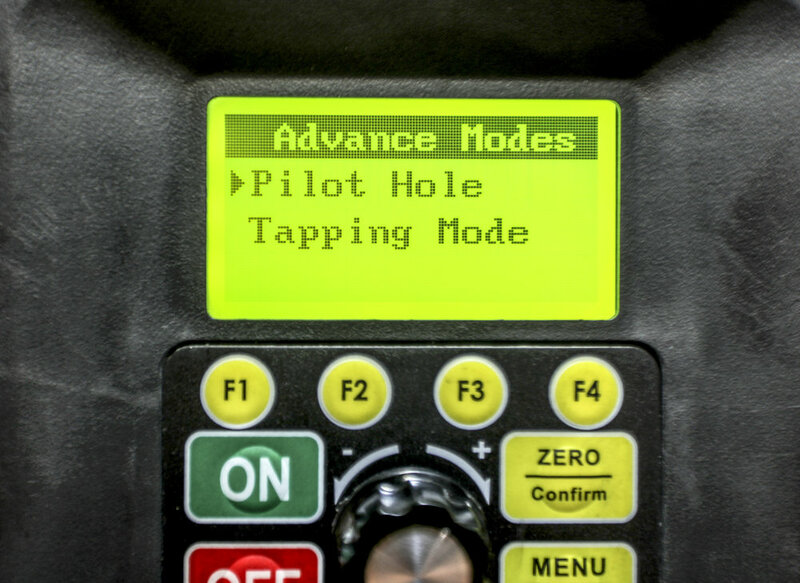 The menu also includes an innovative pilot-hole programme that slows the speed of the bit until it can gain some purchase. As soon as it does, the computer engages the full speed selected for the hole. This avoids the problem of a drill bit’s tendency to wander on hard or round materials like steel or metal tube, even when chucked in a drill press. There is also a tapping-assist mode using the drill press to tap threads. The Nova Voyager has another surprise not normally found on a drill press: a USB port, which will allow the computer programme to be upgraded in the future. Safety has been considered too. Built into the programme is the ability of the motor to sense when the work has come loose. The torque change or excessive vibration will be sensed and the machine will stop. There is a large emergency stop on the front too. You can also set a password to prevent unauthorized use — ideal in schools or in workshops with untrained personnel. There has also been considerable thought put into other aspects of the press. The very solid cast table has machined grooves specifically designed for F-clamps. The central hole in the table is designed for through drilling. Overall the machine is very sturdy and solid, being made of high-grade cast iron, and this density ensures that there is no detectable vibration at the drill tip. In use the Nova Voyager is very smooth and very quiet; apart from the rotation of the drill bit, the motor makes almost no discernible noise. This is clearly a machine for the digital age — the world’s first intelligent drill press. It is only a matter of time until a drive such as this gets mounted on a mill drill or any number of machine tools.